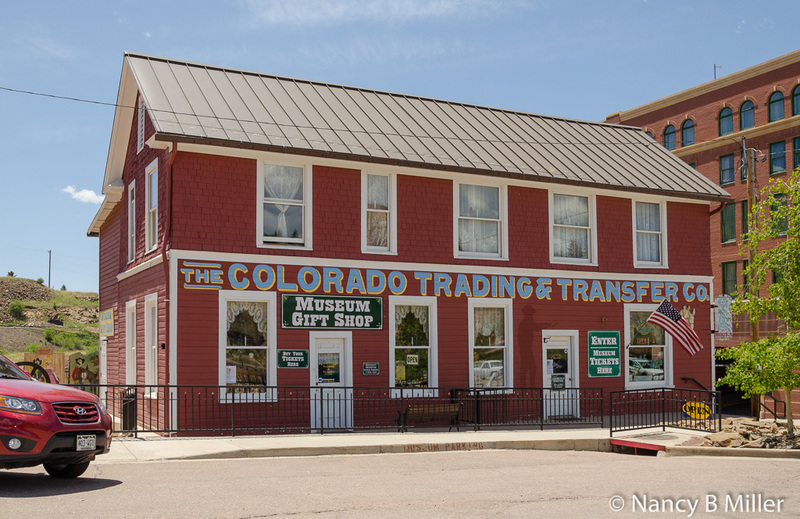 What do the Ghost Town Wild West Museum in Colorado City (the historic area of Colorado Springs) and the Cripple Creek District Museum have in common? They’re housed in the buildings of the former Midland Terminal Railroad, which carried passengers on as many as four daily trains from 1895 to 1931 between the two cities. The line then hauled ore, mining supplies and equipment, and mail, in addition to a few passengers, until 1941. From World War II until its closure in 1949, the railroad concentrated on freight. Midland Terminal was the first standard gauge line in the Rockies. Ghost Town is found in the railroad’s former steam locomotives, maintenance building constructed in 1899. 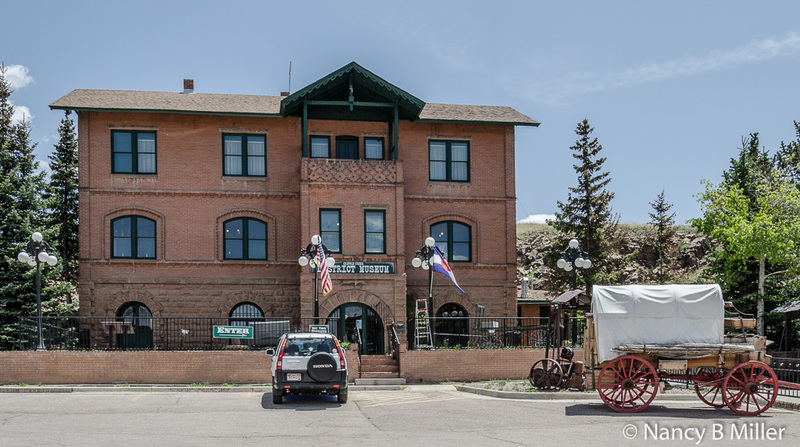 The Cripple Creek depot is home for the District Museum. The railroad’s former roundhouse is found in Colorado City. Constructed in 1887/88, Midland Terminal used it until 1949. From 1955 until 2008, it housed the former Van Briggle Pottery. It’s currently home for an upscale retail center and the Colorado Mountain Brewery. The railroad’s success tied to the Golden Cycle Mill, located across the street. The mill, built in 1906, was destroyed by fire in 1907, and rebuilt in 1908. It proved cheaper to bring the gold ore to Colorado City than to send coal to Cripple Creek. In 1915, Albert Carlton, the instrumental force in starting the Midland Terminal Railroad, purchased the mill. Carlton ran it until his death in 1931, when it remained in family hands. The Golden Cycle was the only gold refining mill left in Colorado by 1931. Mines in the towns of Park, Golden, and Gilpin shipped by train their gold ore to the mill. There it was refined and sent to the United States mint in Denver. During World War II, after its conversion, the company refined lead, copper, and zinc. In 1948, the corporation announced it was dismantling and moving to Cripple Creek. The move occurred in 1949 when Golden Cycle relocated most of its machinery. Its Colorado City’s buildings were torn down to their foundations. Because of this move, the Midland Terminal Railroad ceased operations. The Golden Cycle Mill in Cripple Creek closed in 1962. Currently, only the slag piles and smokestack are visible at the Colorado City location. 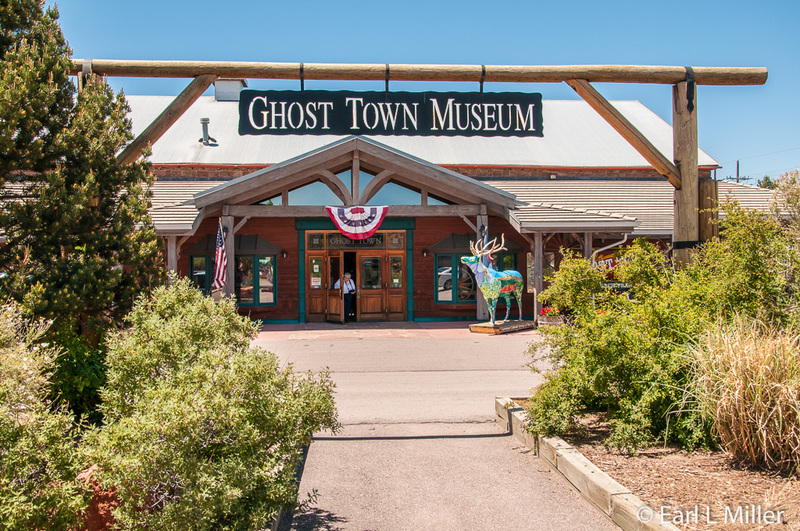 Opened in 1954, the owner of Ghost Town’s purpose was to preserve buildings and artifacts from former Colorado ghost towns by relocating them to this attraction. They built what is supposed to represent a Colorado western town from the 1880's to the early 1900's. A second structure houses dioramas of rooms in a home. Despite the good intentions, what I found was an attraction not worth the $7.50 admission. None of the buildings have the date or previous location listed on them. The artifacts are the same types seen at other historic museums. The two I found most interesting were a washing machine dating from Chicago’s 1893 Columbian Exposition and one of Edison’s first dynamos from the 1880's. They do have stage coaches and old cars such as a Sears Motorgo, the first catalog-ordered car. Buildings represent a variety of enterprises ranging from a saloon to a general store and a newspaper print shop to an apothecary. At the Blacksmith and Studebaker wagon/carriage shop, an animated figure talks about shoeing a horse. Another figure plays the piano in the hotel lobby area. Other buildings represent Miner’s Bank and Trust, a watchmaker, and Wells Fargo and Company. Your admission includes an opportunity to gold pan but the space seems to be played out with the vast majority being white sand. No one is outside to supervise your efforts. Viewing the 10-minute film “Taming of the West” is free but playing a nickelodeon costs a quarter and the shooting arcade is $.50. A large gift shop is on the premises. 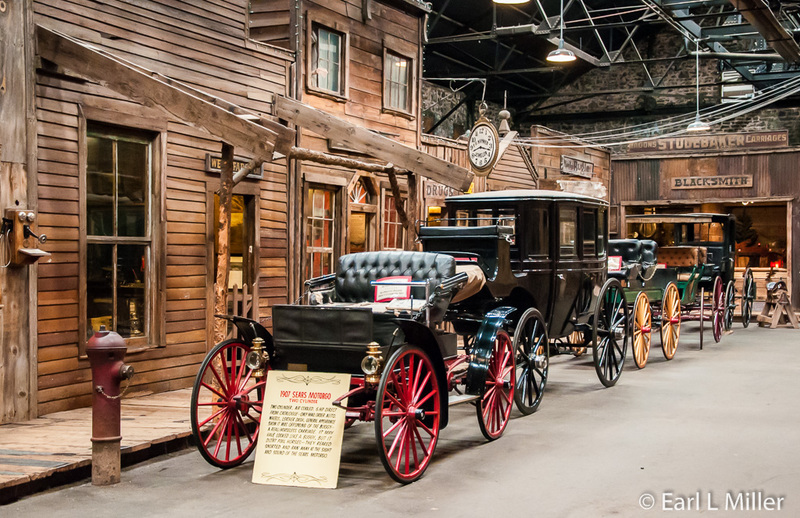 Founded in 1953, the District Museum has been ranked among the top ten western museums by True West magazine because of its authenticity. According to the museum’s manager, Kathy Reynolds, of its 10,000 artifacts, 90% are on display. It consists of five buildings, the largest being the Midland Terminal Railroad Depot. A second houses the former Colorado Trading & Transfer Company adjacent to the depot. This freight company was created by Carlton to work exclusively with the railroad. It was the only commercial building in Cripple Creek to survive the two fires in April 1896 that destroyed much of the town. The building now houses old art and photos, an excellent hour long video on the area’s history, and a Victorian apartment. Its book section in its gift shop is among my area favorites. A 1890's Assay Office housing more photographs, as well as mining equipment, is found adjacent to the freight building. A short video shown here is on gold processing. Outside are two cabins. One belonged to one of Cripple Creek’s many Shady Ladies and the other by a miner. The three-story depot’s rooms are divided into various themes. 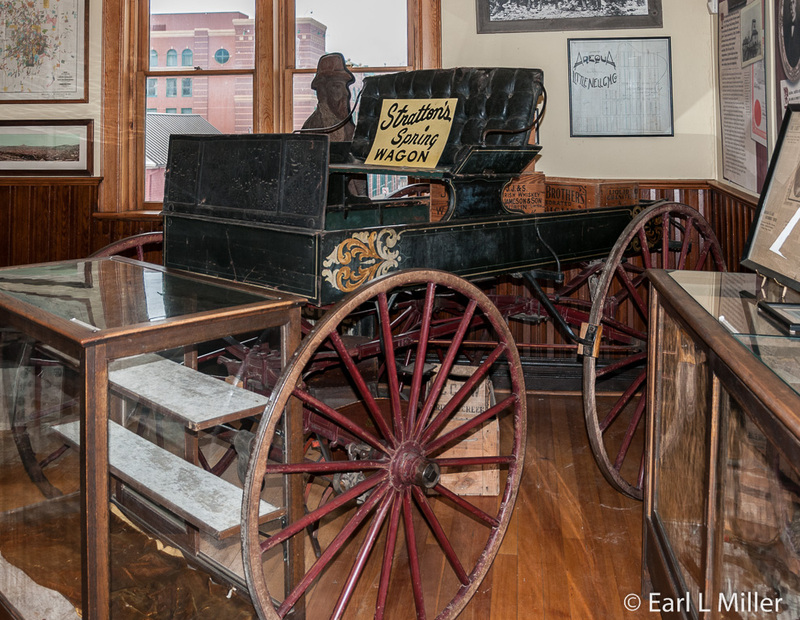 On the first floor, you’ll see the Cripple Creek Room devoted to gambling. In addition to photos of performers who entertained in Cripple Creek, the Imperial Theatre Room has displays from that theatre, which revived the late 1800s melodrama format. The Pioneer Room, formerly the depot’s baggage room, focuses on photos and regalia from early fraternal and civic society organizations and portraits and artifacts from the town’s settlers. You can see the medicine bag of Susan Anderson, a doctor in Cripple Creek, whose story was the basis for the television show Dr. Quinn: Medicine Woman. The original ticket office, passenger waiting room, and baggage room occupied the depot’s second floor. Displays and artifacts on this floor concentrate from the late 1890s to the 1920s. Of note here is Winfield Scott Stratton’s original spring wagon. Stratton, an itinerant carpenter, was owner of the second most prolific mine in the Cripple Creek District - the Independence. You can see mineral specimens, mining certificates, and photographs from the District’s richest area. The third floor was the Stationmaster’s living quarters. It depicts an upper middle class family apartment from the 1890's. This museum is open daily from 10:00 a.m. to 4:00 p.m. Admission is $3 for seniors and $5 for adults. Children younger than 12 are free. The Cripple Creek District was and is the most prolific gold producing area in the United States and fifth in the world. Last year, the mined gold was worth $468 million.